One of the biggest struggles that most people face today is a crazy, hectic schedule. We are so busy that it makes eating healthy a real challenge. Quick, convenience food end up taking the place of healthy, nourishing food when we go, go, go all the time. These less-than-ideal food choices put us on the hamster wheel of experiencing low energy, weight gain, and potential health problems. What if I told you it didn’t have to be this way, though? Read on for healthy eating on the go for busy people! You don’t have to be a slave to your schedule and resort to fast food or processed foods on a regular basis. It is possible to eat healthy foods, even with a jam-packed schedule. It just requires a little bit of pre-planning to ensure success. 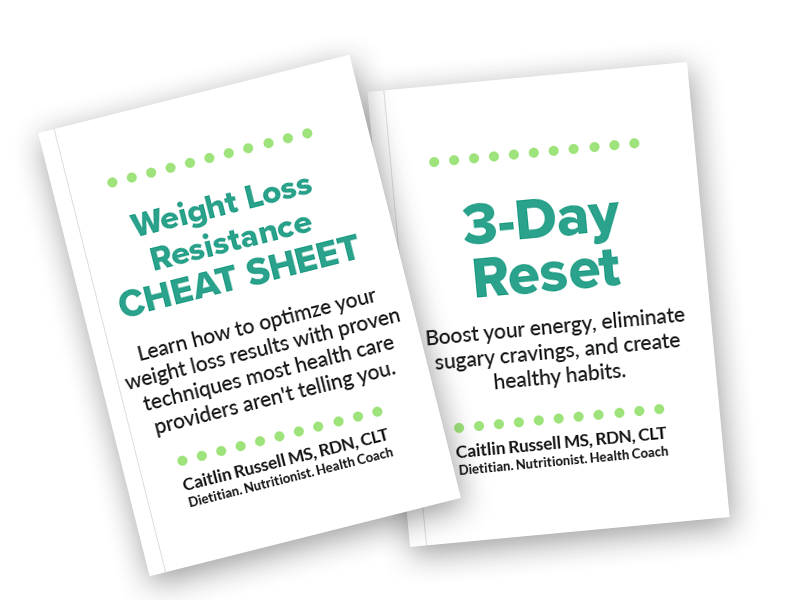 You’ll feel better, have more energy, and your waistline will thank you too. I’ve included a list below of some healthy snack ideas to get you started, so keep reading. There are plenty of circumstances that will take you away from home and make it more challenging to eat healthy food. Take the time to plan ahead and you can relax knowing that you won’t be derailing your healthy living efforts by consuming empty calories. Most of us spend several hours in our vehicles every week running errands or shuttling kids back and forth between activities. If we don’t plan ahead, it is easy to fall into the trap of swinging through the closest drivethru when you (or your family) are hungry. Don’t wait until the point that you are starving to make food choices, as this will almost always lead to bad decisions. Instead, plan ahead, so you don’t have to rely on your willpower alone to keep you on track. Pack easy to carry, healthy snacks, and keep them in either your purse or your vehicle. This way you always have healthy choices right at your fingertips. Just because you are on vacation doesn’t mean you should take a hiatus from your health goals. Encourage a healthy lifestyle on road trips by packing healthy foods to eat in the car. You can pack a cooler to keep handy so you have easy access to snacks while on the road. 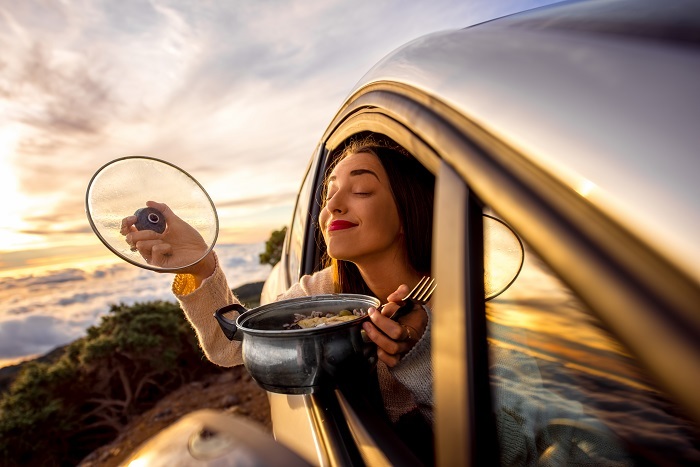 If you are planning on stopping at rest areas along the way, pack a nutritious picnic lunch to eat before you head back out on the next leg of your trip. Even though you can’t pack liquids in your carry-on bag, there are still plenty of options for what you can bring. You can pack wrapped, whole-food snack bars or even pieces of fruit in your personal items bag. With a little creative planning, you can keep your nutrition on track and save yourself a bundle of money you would have otherwise spent on pricey (and often unhealthy) airport food and snacks. The following items are all easy to prepare and convenient to take on the go. Feel free to experiment and find out which snacks work best with your lifestyle. Mix and match options to see what works for you. Almost everyone has a smartphone or tablet with them at any given time. You can use this readily available technology to your advantage. Keep your food choices healthy when you are on the go by utilizing apps that make healthy living simple. If anyone in your family is gluten intolerant, it may be a challenge to find restaurants that serve gluten-free meals. You can use the app called “Find Me Gluten Free” to help find restaurants with gluten-free offerings in the vicinity. 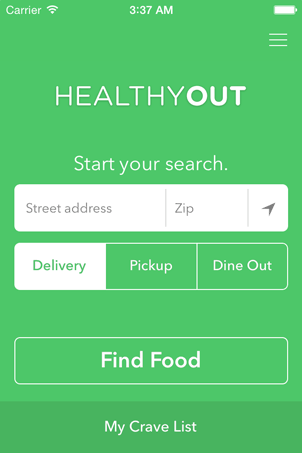 “Healthy Out” is another option to help keep your nutrition on track when eating out. You can search by tags like “meals under 500 calories”, “paleo”, “heart healthy”, and more. Download the app for iOS or Android to find restaurant meals that fit your needs. Another option is to batch cook and plan for leftovers. When you do have time to cook, simply double the recipe and set the extras aside to use later in the week on a particularly busy day. It takes very little extra effort to double the recipe and you will reap the benefits of time savings later in the week. Even with a busy schedule, you can still make sure that you are eating healthy, nutritious meals. By putting in a little bit of planning, you can ensure that you and your family enjoy healthy foods that support your lifestyle and your goals. What tips do you use to keep yourself eating healthy on the go? Let me know in the comments below!